During the off season I was excited to jump into some design work that was just for fun as opposed to for a specific client. Together with Carlie Statsky and Floral Theory, we created some wedding inspiration magic on a beautiful sunny day in Carmel Valley (It was actually my two year wedding anniversary!). I picked Holman Ranch as the venue because of all the amazing awe-worthy locations the property holds. I feel like coral goes so well with the beauty of Holman Ranch and wanted to create a sophisticated type of rustic wedding that brides could actually achieve. This is the result! The gorgeous lace dress was from Haute Bride in Los Gatos and Melissa Hoffman did the best job with the model's hair & makeup. The amazing Mariko of Bee Curious Designs made the most perfect signs to match the coral bar I designed as well as a sorbet station. For my services, portfolio, and all that other goodness, Engaged & Inspired Events is my planning & design site. You can see much more of this amazing shoot featured on Style Me Pretty. Today I'm sharing another shoot from the awesome bridal event I co-founded, The Lab Event. The purpose of our event is to create a bridal experience where vendors bring their work to life and show of to brides. No booths and awkward conversations here! 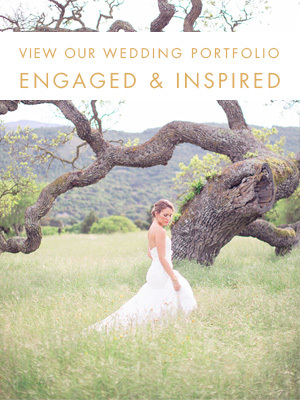 Nope, we have music, drinks, yummy food and SO much inspiration for our Northern California brides! This design was based on a "Rockstar Glam" inspiration board. I love what Kate Miller Events did here. And Gem Photo captured it all oh so well. Take a look at the vendors below. Like what you see? They will definitely be there to help create the most awesome wedding for you. I just love the idea behind this shoot. An intimate get together with the members of your bridal party to get them acquainted before the wedding day. And who doesn't love a good excuse to entertain? The idea behind this shoot was to give the most important people in the bride & groom's lives a chance to get to know each other and have a good time before their big day. We teamed up to create a very intimate engagement dinner party. We know that when a couple gets engaged and they choose their bridal party, it sometimes consists of people that have never met. Most of the time, the bridal party doesn't meet until the rehearsal dinner. So, we created a dinner party to introduce the whole gang! We were inspired by the classic black and white theme and added a sweet touch of honey! Vases were filled with honey and hand painted gold honey jars held informal posies. A ruffled cake added a modern touch, while still being very classic. The wedding party also got a chance to practice posing and getting comfortable in front of the camera. This past January the fruits of our year-long planning labor came to life at The Lab Event, a totally awesome bridal experience unlike any other. Myself alongside Erin of Bustle Events and Yasmin of Floral Theory produced an event filled to the brim with inspiration for brides. 6 amazing teams of vendors put together mock weddings showcasing the very best of their work. This team was assigned an inspiration board entitled "Poetic Whimsy" and boy did they hit the nail on the head with their amazing ideas. Shot by Volatile Photography and designed by A & B Creative, they didn't miss a beat when it came to the details. Twigss did a phenominal job on the florals, (I mean, look at that bouquet!) and Batter Bakery brought it as always with a dessert bar is way too good for our own waistlines. The entire shoot was featured on Ruffled Blog. Make sure to check it out! KNOWING OUR WANTS: We were able to establish some known things about our wedding day that helped pare down the giant list of venues we started with. For example, since we knew we were going to have a spring wedding in Seattle, we ruled out all venues that were primarily outdoors. The weather is unpredictable and generally rainy here until about July and I wasn’t going to kid myself that I would luck out with the perfect 70 degree spring day. So, farms and parks generally got cut off. Also, after we put together our inspiration board, it was clear we wanted a building with history and industrial edge. There were some hotels and restaurants that made the first cut, but we knew golf courses and newer venues would be off our list. Then we narrowed it down further by price and set a couple other deal breakers, like venues that wouldn’t allow us to have a full bar. It was tough to knock out some, but as Erik told me “we can’t have 20 weddings, you have to rule something out somehow”. SPACE: We’re inviting around 150 guests. Surprisingly, I found this to be a tricky amount of people to find a venue for. Most small/midsize venues comfortably fit about 120, but since we have a long engagement and people basically have this on their calendars already, we are expecting more than the traditional attendance percentage. I didn’t want a place that was going to feel really squished with 130 or 140 people. On the flip side, most large venues can fit 300 or more, and some of those places we visited felt pretty cavernous and we wanted to make sure our wedding feels cozy and happy. In the end, our final few venues were the ones where our guest size would be comfortably accommodated. FLEXIBILITY: A big thing for me was flexibility on timing. I’m always disappointed when I go to a wedding, and the party just gets really rocking around 9 pm and then all of a sudden its last call, last dance and you’re thinking “now what”. On my wedding day, I might be done by 9, but I want the flexibility to make that decision or party until the wee hours. One of the criteria on my list was to try and find a place either with no curfew or a late curfew so we wouldn’t feel quite as rushed through the evening. This helped out rule out venues that required us to be cleaned up and out any earlier than midnight. LIGHT: One of the difficulties in looking for historical industrial venues is that many of them are in older buildings without great natural daylight. Even though our ceremony is going to be in the evening, I looked up the sunset time for our wedding day, and its not until 7:30 pm. That means if we get started around 5:30, we still have 2 hours of daylight to enjoy. We ruled out a couple venues that just felt really dark and that we knew wouldn’t be great for photos. In the end, we chose an art gallery in an up and coming older neighborhood of Seattle near the space needle (the two images above are from the gallery). We're planning to have the ceremony and the reception in the same location. The owners are fabulous and have been so great to work with. We get our choice of caterer and can provide our own bar, which should save us a good bit of money. The space is beautiful, and there are skylights to bring in great afternoon light. There is no curfew so in theory our guests can party their hearts out. Its nearby to several hotels and other amenities, and there is decent parking (which can also be a challenge in an urban setting). Locking in the venue really made things feel real – now its time to start imagining the details! As I've mentioned before, I have a slight obsession with peacocks--they appear frequently in Art Deco and Art Nouveau artwork, and the bright jewel tones and metallics offer up a to-die-for wedding palette. While there will be no live peacocks at our wedding, there will be a few special details inspired by my feathered friends. Here are some peacock images that have been hovering around my Pinterest board for a while. One of my favorite things about these final stages of wedding planning is that all of those little details that have been floating around my head for the last year are beginning to come to life. Purchases are being made. Decor is being finalized. While I'm savoring keeping some of these little details secret until the big day, know this: things will be sparkly (shocking...I know). Etsy has been a blessing and a curse in my search for special and personal details. Before you enter into the rabbit hole that is Etsy.com, know this: there are more people selling vintage metallic wedding favor boxes than you know. I've been having a ball playing around with place settings recently. (Did you see my spring-inspired place setting?) Today's setting is a little vintage, a little colorful and one of my faves to date. Thanks to the fabulous Jason & Anna Photography for shooting these gorgeous images. Spring is slowly starting to show its face here in California but I'm hearing of snow for some of you! Today's place setting was inspired by the upcoming weather and introducing some bright colors back into my life (Although if you follow me on Instagram, it is pretty evident that winter doesn't stop me from color). Creating the perfect place setting is one of my favorite parts of a wedding. This is the chance to give each guest an individual experience of your wedding. the stakes are high and the options are endless. Recently I've been loving the horizontal napkin under the salad plate. If you are doing something with a brighter color, the horizontal napkin gives the setting a pop of color but doesn't overwhelm the table as a whole. The pink, purple and aqua color palette is so fun and so spunky! Perfect for spring time.